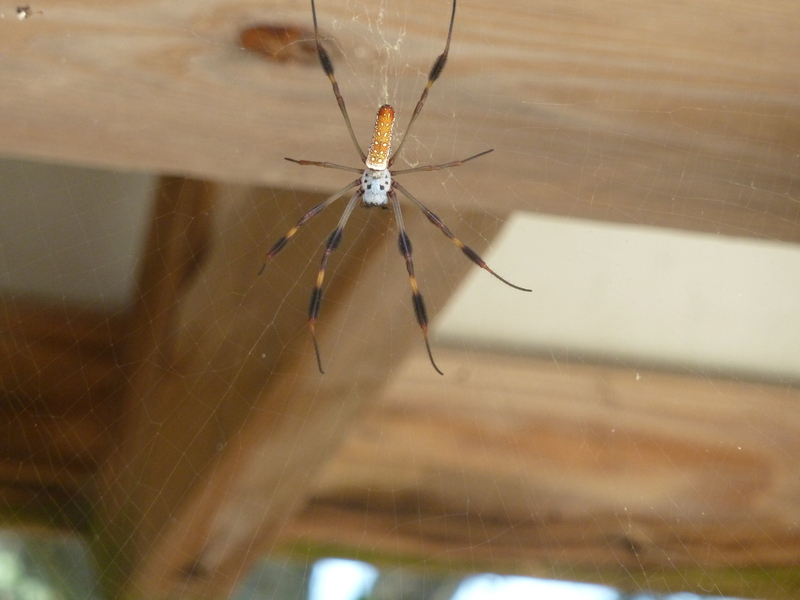 Why does every insect here in Florida look like it could easily tackle and eat a grown adult? I really thought we had it so tough in the United Kingdom with Wasps that dared to invade the sanctity of a Summer BBQ; Daddy Long Legs that had the impudence to get into our houses and fly around with that weird dry rattle that their legs and wings made; Adders that we never actually saw but knew were out there somewhere, watching us; Garden Spiders that appeared in the Winter and seemed to want nothing more than somewhere warm and dry to die; Bees that made an annoying buzz; those weird little Devils Coach-Horse beetles that I haven’t actually seen for the past 10-15 years but still creep me out whenever I think of them; Slugs on our vegetables; the *crunch* of doomed Snails as we walk down our paths late at night; Earwigs scuttling around the edges of the room; those horrible little tiny Thunderflies/Thrips that get into your hair and tickle your skin in the Summer months. However, if you think about it Wasps are fine until you trap them under a glass and get them drunk on beer, or squash one and inadvertently trigger a pheromone release that calls for angry, defensive backup; Daddy Long Legs are nothing more than bugs on stilts and spider-fodder, presenting no real menace; Adders are shy and non-aggressive and due to habitat destruction are at risk of endangerment; Garden Spiders keep the numbers of winged pests down and tend to only come out at night when everyone has gone to bed, besides lacking the jaw strength to do us any real damage; Bees are also endangered, thankfully non-aggressive and are essential to the fertilization of plants, flowers and trees; I haven’t seen a Devils Coachman since I was in middle school, so not really a problem; Slugs are food for loads of other birds and insects and can be kept away from plants by a vigilant gardener; Snails are also a big part of the food chain, and are also easily dissuaded by a determined gardener; Earwigs I can think of no purpose for, however they aren’t aggressive and don’t present any physical threat to us; Thrips drive me mad, but at least they don’t bit me whenever they land on me, they just seem to enjoy dancing aatround on our skin. My point being, how many of the critters in the UK actually do us lasting harm? Besides allergic reaction to stings, we don’t really suffer too much. We tend to avoid marshland as a residential location, so there aren’t many stagnant pools for midges and gnats to breed in, when walking in our countryside I’m more concerned about walking between a cow and her calf than I am any sort of insect or critter. Which is why I’m so out of my depth in Florida as there are so many things here with multiple limbs that I need to be wary of, avoid and keep an eye out for. Besides the obvious ones like Black Widows and Snakes, I keep on seeing brightly coloured, beautiful insects that terrify me because of their newness. In the UK I know exactly what to look out for and how to deal with it, but apparently I’ve yet to experience the delights of the home-invading Wolf Spider that appears in the colder months and is actually an aggressive, malicious little horror. Oh Britain, all I ask is that you spare a few minutes to appreciate your tame and uncomplicated wildlife that you are surrounded by. Next Post Did the Earth move for you? Me neither.